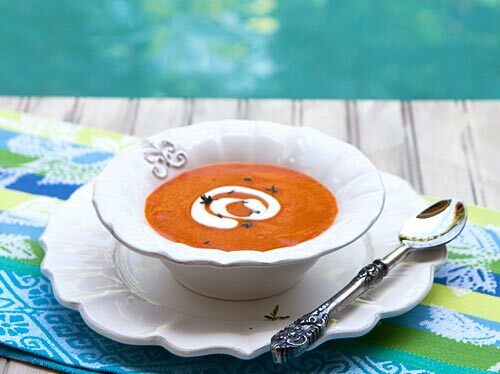 One of my favorite treats growing up was a bowl of creamy tomato soup that my Mom would serve with gooey grilled cheese sandwiches. I have made a number of variations of this soup throughout the years that often included heavy cream, but I decided I wanted to rebuild the soup, creating a healthier version. My requirements were that the soup had to be thick and creamy without actually containing cream, and the soup also had to have a full, rich tomato flavor with lots of depth. This recipe was adapted from one I found on the Eating Well website, and my family all loved it and were quite surprised it was a healthy version with no cream. I used my Vitamix blender which does an amazing job of blending just about anything creamy and smooth, but any blender or even a hand blender would work. To garnish the soup, I simply thinned a little fat-free Greek yogurt with milk, but a drizzle of basil pesto, or even a grilled slice of bread topped with melted reduced fat cheese would be delicious also. The soup is thickened with brown rice and silken tofu instead of cream, adding both fiber and protein to the soup. Silken tofu and brown rice are used to thicken this soup instead of cream creating a rich, creamy flavorful soup. Heat the oil in a heavy bottomed saucepan and cook the onions until translucent on medium heat, about 5 minutes. Add the broth, water and brown rice and bring to a boil. Reduce the heat and cook until the rice is very tender, about 15 to 20 minutes. Stir in the tomatoes, tofu, tomato paste, and vinegar, and cook for 5 minutes. 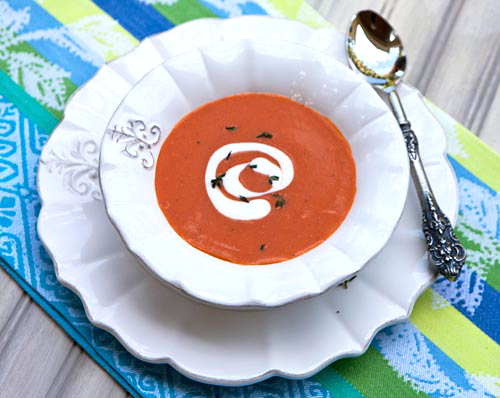 Season with salt and pepper, then puree the soup in batches until creamy and smooth.